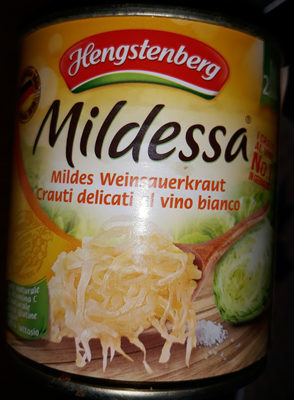 Mildes Weinsauerkraut Zutaten: Weißkohl, Wein, Salz. 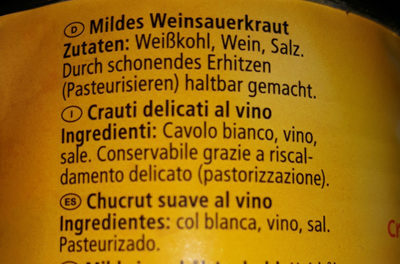 Crauti delicati al vino Ingredienti: Cavolo bianco, vino, sale. Chucrut suave al vino Ingredientes: col blanca, vino, sal. Product added on October 3, 2016 at 10:29:35 AM CEST by date-limite-app. Last edit of product page on April 3, 2019 at 12:37:34 PM CEST by roboto-app. 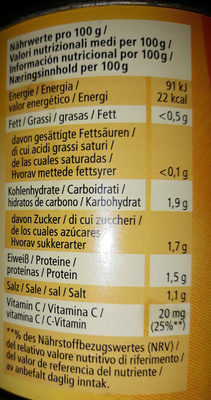 Product page also edited by anticultist, foodrepo, kiliweb, openfoodfacts-contributors, svago, yukafix.